The band consists of Susan Jones on Jazz violin (all violins and viola on cut #1), Tom Jones on drums, Bob Abbott on bass except on #1,2, 5 and 12. James King plays bass (cuts 2, 5 and 12). Fred Leider plays jazz cello on #1. Guitarists include: Brian Litz (cuts 6,9,10 and 11), Gerry Kunkel (cuts 1,7,8), Paul Wingo on (cuts 3,4 and 7), and Pete Fields on (cuts 2,5,and 12). Guest artists include:Chick Hall (guitar on #10), Scott Harlan (bass solo on #8), amd Seth Kibel (flute on #7, 12 and sax on #11). 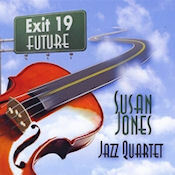 The title tune "Exit 19" features the sound of jazz/rock string quartet with rhythm section. It's a rocking tribute to the Baltimore Beltway of the past. "Like a Song" was concieved in the Paris airport and carries a French feel to it. "Groovin Along' is my one funk/hip hop tune on this CD. Scott Harlan totally rocks this tune with a great fretless bass solo. "Springing Along" and "Autumn Breezes" are part of a jazz four seasons suite. "Montunafish Sandwich" is exactly what it's name implies. Chick Hall's solo on "Tell Me Tell Me Baby" still blows me away everytime I hear it. "Call To Me" and "From the Fog" have an etherial quality that will become evident when the tunes are sung on my next CD. I hope you have as much fun listening to this music as we had making it. Original acoustic jazz from violinist Susan Jones and saxophonist/clarinetist/flutist Seth Kibel, drawing upon a variety of diverse musical influences. The brand new CD release Nuts and Bolts brings together Seth Kibel and Susan Jones, both of whom play with numerous musical ensembles in the Washington/Baltimore region, for an album of original acoustic jazz compositions. Both have demonstrated their expertise in jazz, swing, blues, klezmer and classical music throughout the Mid-Atlantic area. In their first collaboration, they introduce diverse elements into their compositions and provide skilled performances and improvisations. The title track, written by Kibel, has a funk and rock and roll feel. His "Klezmer Nova" combines traditional Jewish folk sounds with bossa nova rhythms. Jones provides a Cuban flavor with "Un Poquito de Salsa" and draws on the Ladino folk tradition - which combines Spanish folk music and Jewish soul - on her arrangement of the traditional song, "Los Bilbilicos." They are joined by guitarist Paul Wingo, pianist James Levy, bassist James King and bassist Bob Abbott, who also contributed an original tune. The album includes six songs by Kibel, who plays tenor saxophone, clarinet and flute on the recording. He is leader, clarinetist, and composer for the area's premier "alternative klezmer" band, The Alexandria Kleztet. That band has released two albums, both of which won the Washington Area Music Association (WAMA) award for Best World Music Recording. He also fronts the swing group Corner Pocket and Seth Kibel's Dixieland All-Stars as well as performing with numerous area bands. He spent several years as saxophonist for The Daryl Davis Band. Jones contributes three original tunes and arrangements to the album and plays violin. 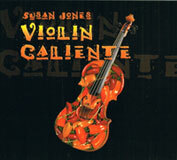 Jones leads the Susan Jones Quartet, which has released one album, Violin Dreams. She performs regularly with the Machaya Klezmer Band, Silver String Quintet, Mariachi De las Compadres and the rock group Jane Doe. These recordings were done in the spirit of a live performance. There were no overdubs. We invite you to listen to our session live from Avalon Studios.